I remember my kindergarten teacher, Mrs. Britton. She was a heavy set woman who wore thick lensed eye glasses. Her glasses seemed dwarfed by her face. I adored her. It was easy to see that I loved going to kindergarten everyday. I couldn’t stop skipping. I was in the big-kids school. Our classroom had a playhouse. We sat 4 to a table on tiny chairs at a round table. I learned how to write my name in cursive while in kindergarten. I watched my Mom and then emulated her handwriting. I asked her to write my name in cursive. She showed me. Oh, all those swirling letters. A-L-E-C-I-A looked so fancy. Grown-ups wrote in this code. I would write like this! I practiced and practiced. One day in school, when it was time to write our names on the back of our art projects, I proudly wrote my name in cursive. Mrs. Britton hung our art in the hallway. She pulled me aside. She flipped over my art. She pointed to my name. She asked why I wrote my name like that. I proudly told her and my classmates that I had learned cursive. She told me not to do it again. She firmly said I would learn cursive in an older grade and that I needed to stay with my class learning to print. She looked disappointed. I didn’t want to disappoint Mrs. Britton. I was mortified. Quivering-lip, fighting-back-tears mortified. I had done something wrong and everyone heard her say it. When I got home, I cried. Every week, two kindergarteners were assigned the job of “turning-in” the milk money. Mrs. Britton collected the money from us, placed our money and parent form in an envelop and then trusted us to walk all the way down the hall to the office. It was a huge responsibility. Every teacher after Mrs. Britton dealt with more than just me, they dealt with me and diabetes. As I listened to the breaking news today, I was dumbfounded by the horrific tragedy which occurred in Newtown, Connecticut. I listened at my desk while this senseless story developed. I walked home from work with a heavy heart. I arrived home, shut the door, sat down, hugged my dog and cried. Those kids were indeed Kindergarten Babies. My heart aches for them and their families. I cry for those children who witnessed this travesty and I hope somehow, some way they remain just that, babies. I started a blog post a few nights ago about evaluating pump sites. As I wrote it, some interesting things occurred with the numbers and like I am prone to do, I was off on a tangent. I always liked math. I loved algebra and geometry. When I was a little girl I would actually dream about math problems and shapes. Later, I took my appreciation of math and interest in art as a sign to go to architecture school. Looking back, it was ridiculous that in my extremely sheltered world, I was supposed to be picking such a specific field of study and life path, at 16 years old, however at 12 years old, I knew I wanted to create. As long as I can remember, my favorite number has been 12. I recall a teacher saying that a favorite number should be a single digit. What did she know, right? On sports teams, I always tried to get “12” on my jersey. In architecture school I always tried to group design elements in derivatives of 12. When I write any list, I will keep adding things until I get to 12. My first and last name are both 6 letters. My career started with a company that was also a 6 and 6 name. Yep, 12. My current business is two 6 and 6 names. Again, 12. Most of the time I act like I’m 12. Twelve. What can I say, I just love it. So in my post about pump sites, I started doing the math. I took shots for 21 years (12 backwards). I have been on a pump for 12 years. I have had a Dexcom CGM for 12 months. With my warranty expiring on both my Animas PING pump and my Dexcom 7+ in the next few days, I have been filling out paperwork to get new versions of both. “12” keeps popping up all over the place. I had to ditch the pump site topic. Twelve was calling to me. In grade school we did the project envisioning where you will be in the year 2000. I used to change that topic to the year 2012. Flying cars and my Jetsons-esque lifestyle haven’t quite happened. Diabetes hasn’t been cured. I don’t have kids. But, I’m still here to celebrate 12.12.12. That counts, I AM HERE for 12.12.12. Happy 12.12.12 to all of you. I hope you get a chance to make it special. Do Good, Feel Good is a phrase I say a lot. I probably tweet it even more often. It’s one of those phrases that just sticks in my head and plays over and over (kind of like The Cranberries’ Zombie or recently Kris Kross’ Jump. I’m sorry if you now have these songs sticking in your brain too). I digress. Oops. Yes, Do Good, Feel Good. 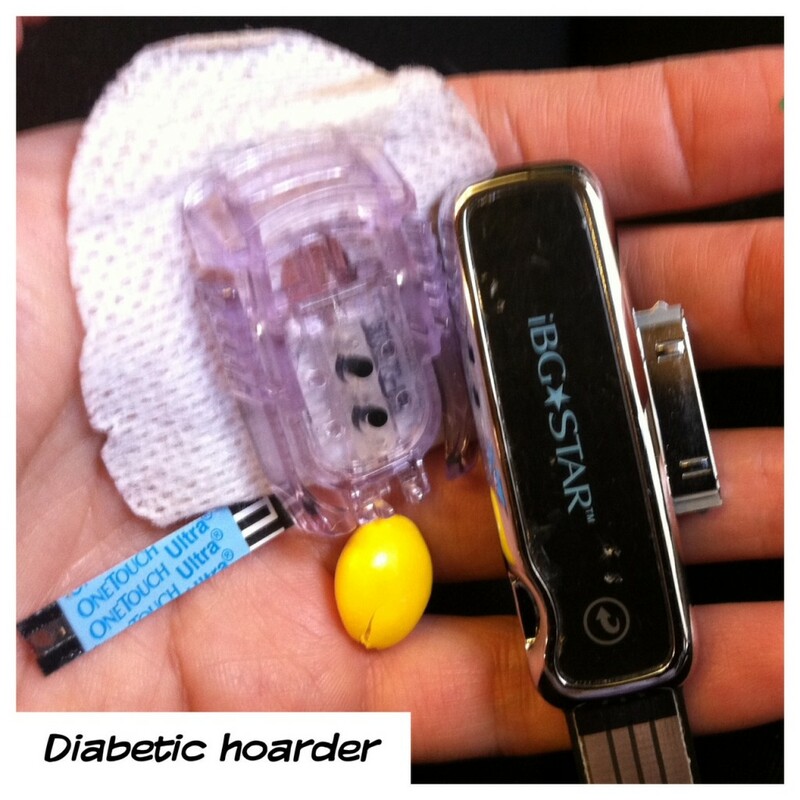 When I researched getting a CGM, specifically my Dexcom 7+, I started reading diabetes blogs in a mildly obsessive way. That was my introduction to Kim from Texting My Pancreas. Her blog led me to other wonderful diabetes blogs. When I decided to bite the bullet (well in this case, let my boyfriend attempt to insert the Dexcom into the back of my arm), we watched her video twice possibly without blinking. When I put the Dexcom in my arm the first time solo (I’ll admit it, I was scared), I watched that video two more times (this is the part where I must mention she has better gravity where she lives). Anyway, Kim was a big help to me and I frequently refer to her in my diabetes mentoring program when questions about CGMs arise. Kim started an “event” for the month of December called Give All The Things (you really should click that to see what I’m talking about). I was immediately more smitten with her than I already was. I won second place at the very beginning of the month of giveaways. I won a small plush pancreas. Oh you don’t know what a plush pancreas is? Well you can see it here. It made me laugh but it got me thinking about Kim’s pay-it-forward idea, an idea I try to incorporate into my own life. I contacted Kim and told her a little about my jewelry design business and it’s connection to my fundraising walk teams, Alecia’s Stem Cells. I offered to give her a pair of earrings for her giveaway. Although it is not totally diabetes related, the jewelry IS made by a T1D (me) and 10% of the proceeds go to JDRF. Kim wrote the sweetest note back. It put a big goofy grin on my face. Today Kim is giving away the earrings at Texting My Pancreas. I saw the tweet about it this morning. I immediately smiled. What started as an overwhelming day still is overwhelming, but her post lightened me. Twice I have checked the comments (which is how you enter her contests) and both times I smiled more and “may” have had some extra moisture escape my eyes (must be allergies, I certainly am not crying again, right?). If you have some time, check out the comments of some of her other Give All The Things posts. It will immediately remind you how fortunate you are to be part of the DOC. Do Good, Feel Good. Thanks Kim. While searching my purse for some notes I’d taken, I found yet another secret compartment. Here are the contents: One Touch Ultra used test strip (AKA diabetes jewelry supplies), used Dexcom 7+ sensor (AKA hey-can-I-make-jewelry-out-of-this-? supply), iBGStar USB demo, 1 slightly crushed Skittle.